If you tend to travel during the year, you know how disruptive a trip can be to a regular workout routine. Who has time to squeeze gym time into work trips and conferences? Vacations can make finding time to exercise even more challenging. Who wants to do lunges when it’s time to party!? Well, the two don’t have to be mutually exclusive. So we’ve put together our most practical and easy hotel workout tips. These will equip you with what you need to make the most out of your traveling gym—motel, hotel, or otherwise. Hotel gyms are not always the most exciting or well equipped. 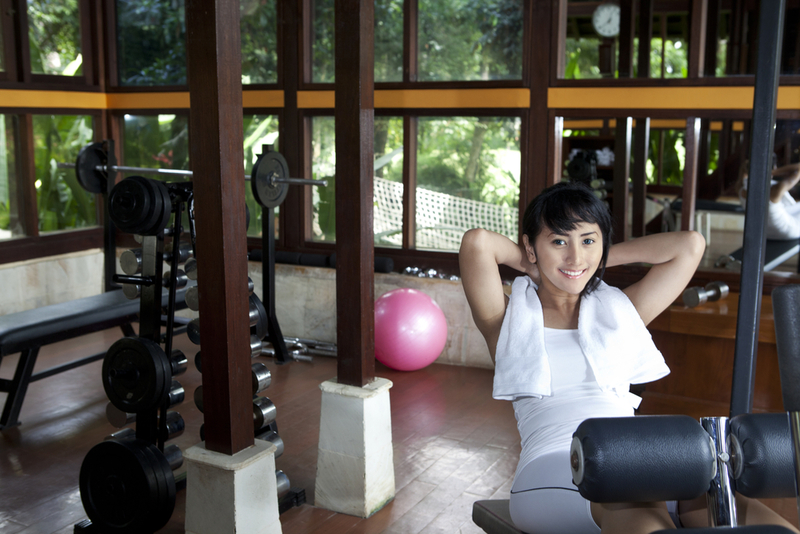 Use these tips to make the most out of whatever size gym room your hotel has to offer. Come prepared – Bring along the basics, like a towel, water bottle, and mat so you can get more out of available flat space. If you find yourself in a windowless box in the basement of a Motel 6, music is your friend. Get in some cardio – Sometimes, a treadmill or elliptical machine will be your only option. Most modern machines now include pre-programmed workouts, such as hill training or interval work. Mix it up and do something new and challenging so you don’t get bored. Create stations with what you have – Create a circuit of workouts by moving from exercise to exercise. For example, you could do ten minutes on the treadmill, then a five-minute plank routine, before moving to weight lunges (if hand weights are available). Rinse and repeat three to five times, limiting rest time in between exercises. Hit the pool – So what if everyone else is poolside? The pool is your friend! Try some pool calisthenics and dynamic movement routines, tread water for fifteen minutes, then do a few laps freestyle down and back. What better place to get your heart rate up than in the pool? Get going early – The best way to ensure you get your hotel workout done is to get it done first thing in the morning. This way, you don’t have to worry about fitting into you busy schedule later on. Clear and prepare a space – It seems simple, but adequate space is a must. Move furniture around, turn the television off, put a mat down, and get some music going so you can focus on your workout. Think burpees and bodyweight – You don’t need a lot of space to go through a challenging bodyweight routine. Get in a good warmup stretch, jumping jacks, and a quick ab routine. Then set the clock for ten to fifteen minutes and complete one hundred burpees before the time is up. There are a plenty of bodyweight workouts to choose from. Try a yoga routine – All you need for a yoga routine is a mat and a little bit of space. Bring in some natural light if you can and try a thirty-minute yoga routine. Yoga can do wonders for your energy and balance, especially while traveling. Finally, it’s important to remember that you probably won’t be able to recreate your workout routine completely. Put yourself in a maintenance mindset, where the workouts you do on your trip are to keep your baselines for when you do return home and get back into it full swing. Plan for the bare minimum in terms of time and equipment, come prepared, and these hotel workout tips should be more than you need to break a sweat no matter where you’re staying. Fall risk is inherent to certain activities no matter who you are. Yet, some conditions increase fall risk during certain types of movement and exercise. One in four Americans aged sixty five or older, for example, falls each year. Other conditions, such as obesity, diabetes, and neurological disorders, can contribute to increased fall risk as well. This doesn’t exclude people with higher fall risks from exercise! Here are five workouts that reduce or eliminate balance and coordination issues, perfect for people with higher fall risk. From a sitting position on the floor, back to a wall and legs straight out, lift and hold your leg a couple inches from the ground. After ten to fifteen seconds, release and repeat with the other leg. You can also sit in a chair, instead, back straight, and lift leg until it is parallel to the floor. Alternate after ten to fifteen seconds. Keep the core engaged. Sitting upright in a chair, or on a bench, keeping good posture, point elbows out and slowly push arms upward to the sky until fully extended. Slowly release back down to beginning position. Focus on slow, deliberate movements, always keeping the core engaged. Use three, five, or ten-pound hand weights to increase resistance. In situations where a traditional treadmill is too risky, the elliptical machine can be a safer, more stable alternative. Start light and slow, keeping body-weight impact minimal. Always hold on to the handles for safety, and increase workout time incrementally as you progress. Another way to decrease body-weight impact during exercise is to hop into the pool. Swimming and water aerobics are one of the best total-body workouts that carry little fall risk. Most gyms offer group pool workout classes that can be dynamic and engaging. Good for the heart, too. Perhaps the safest way to control fall risk is training with the Anti-Gravity Treadmill. Under the supervision of a trained physical therapist, patients and athletes can reduce body-weight impact in 1% increments. Thanks to a sturdy harness, participants can walk or run unrestricted by fear of falling or pain and make adjustments to their gait on the fly. This is just a small sampling of the many exercises suitable for people with higher fall risk. Have fun and mix it up to keep things interesting. Explore different muscle groups and systems to target, both upper and lower body. The main thing is to keep moving in safe and rewarding ways. There is a hero in us all that loves to “just push through.” Push through the pain. Push through the fatigue, soreness, and hunger. While there is nothing wrong with a strong work ethic, it can be a mistake to push on at the expense of much needed rest and recovery. Among the many reasons why your body needs rest days, here are five that might give you pause the next time you want to skip a day off. Working out too much can push your muscles, bones, and ligaments, leading go overuse injuries. Think tennis elbow, tendonitis, sprains, and tears. It can also lead to overtraining syndrome, a common condition that can include dragging fatigue, sleep disruption, and mood swings (among other symptoms). Have you ever gotten the feeling after a day or two off that you return that much stronger and more energized? During nearly any kind of training, inflammation and even small tears occur in muscle tissues. During rest, the healing and regeneration of these muscles is what allows us to build strength, endurance, and muscle mass. Rest days are also an opportunity to replenish the things your body needs to recover. A diet rich in lean protein, fruits, and vegetables will provide some of the calories, vitamins, and nutrients lost during exercise. Of course, you should continue drinking ample water throughout the day to stay hydrated. Not only will diet and water intake help you recover, it will prepare you for tomorrow’s workout, too. Time away from the physical challenge and psychological strain that accompanies exercise, workout regimens, and sporting activities can do wonders for the mind. A bit of mental rest can recenter your memory, focus, and motivation that might suffer if you burn yourself out. Take a full day off and feed the mind with positive stimulation. 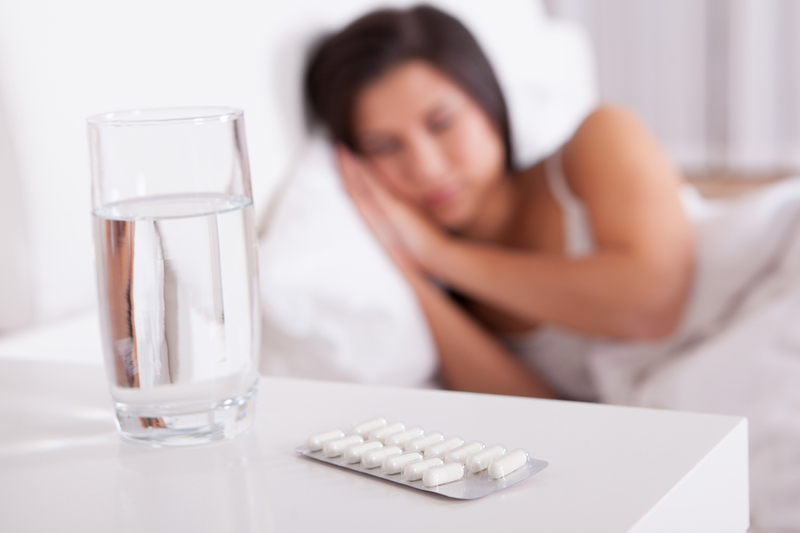 Taking a day off when your body needs rest isn’t a sign of weakness, or quitting—it’s smart. The world’s top athletes and trainers swear by it (alongside proper nutrition and hydration). Just getting a bit more sleep every night can make a world of difference in you mood, energy level, and motivation. How long? Allow one to two days between working out the same group of muscles. These rules vary depending on type of exercise and body type, so it’s always a good idea to check with your physician or physical therapist to confirm. Either way, rest is essential to better performance. Put it all together and you’ll come back stronger than ever. What Does Patient-Therapist Collaboration Really Look Like? 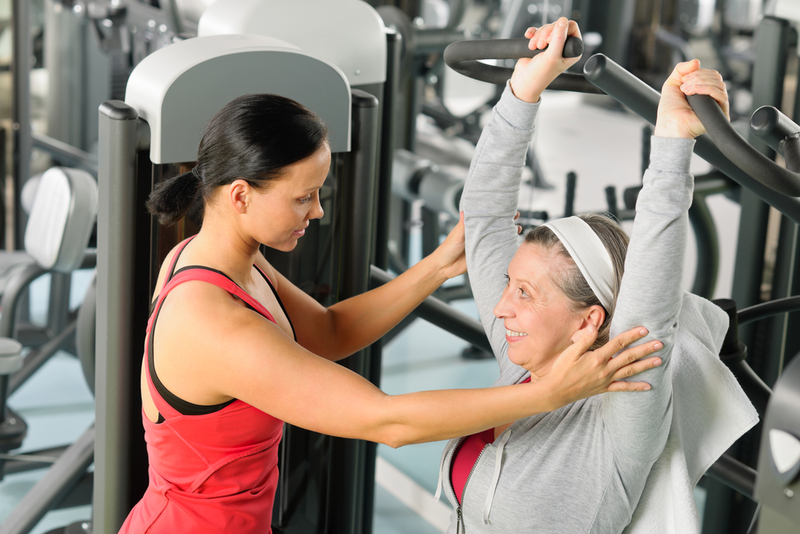 From a patient’s point of view, the right fit for physical therapy can be challenging. Since this will be an ongoing relationship, lasting at least the duration of the physical therapy program, the first thing to look for is an atmosphere of communication, trust, and collaboration. What, though, does patient-therapist collaboration actually look like? Here are four common attributes of strong patient-therapist relationships that can help both patients and therapists evaluate clinical environments. Patients want to know not only that they will be heard, but that they will be treated with respect and equanimity no matter the information they are communicating. Therapists can engender more effective collaboration by encouraging patients to communicate early and often about whatever they feel is important to share. This can be as simple as providing an opportunity at the outset of each visit to share updates, concerns, or questions a patient might have. Over time, patients will feel more comfortable communicating valuable information that can help shape the pace and direction of the therapy program. Open patient-therapist communication goes hand in hand with trust. Physical therapists can establish trust by listening to a patient and, where appropriate, taking action on the information provided. When patients recognize that their therapist is making clinical decisions in the patient’s best interest—based in part on the information the patient is providing—they will be more likely to stay engaged with the program. When expectations around trust and communication are in place, patients will feel more comfortable communicating about their comfort levels and pain, functional ability, insecurities and worries. With that information, the therapist and patient can work together to set realistic, mutually agreed upon goals, then design and adjust therapy programs based on this mutual understanding. When trust, communication, and goal setting are collaborative in nature, both patients and therapists will be more engaged, thus increasing the likelihood of more positive outcomes. It should come as no surprise, then that where strong patient-therapist collaboration is found, so, too, are consistently good results. Posted in Physical TherapyLeave a Comment on What Does Patient-Therapist Collaboration Really Look Like?